Synergy Physical Therapy provides expert therapy treatments with a focus on holistic approaches to healthcare. 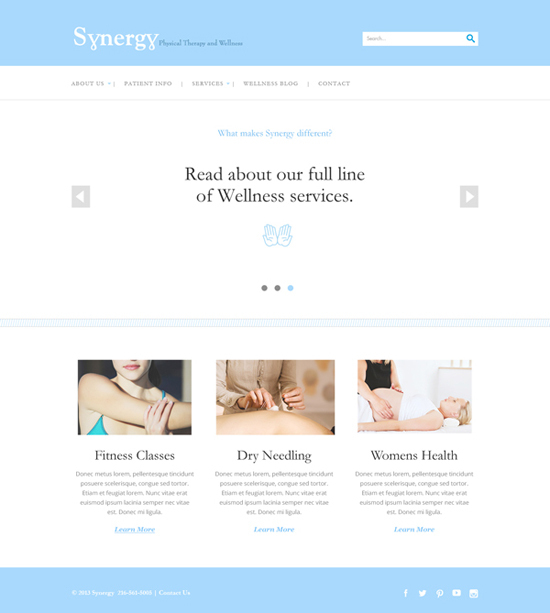 Go Media worked with Synergy Physical Therapy to plan, execute, and deliver a fully responsive website design. The website design focused on showcasing the services offered as well as encouraged visitors to check out their Wellness Blog. The minimalist design allows visitors to easy find the resources they are looking for when searching for a physical therapy provider as well as provides them with patient information and tips to staying healthy. We kept the look-and-feel clean to make navigating the site a breeze. We also kept the look cohesive with their brand image so that patients would immediately recognize Synergy Physical Therapy upon viewing the site. One area where Go Media really wowed Synergy was with the rotating slider banner on the homepage. With bold text and snappy icons, prospective patients have a fun and eye-catching way to find exactly what they are looking for when they visit the site. By offering navigation in the banner, key pages will receive increased exposure and visitors will more easily find what they are searching for which can decrease your bounce rate and increase your SEO efficacy.